Ever since I have started the wood pallet recycling it feels like a kind of day dreaming is going on with me. Like I am always up with different wooden pallet recycling projects. Even when I am not up with the wooden pallet recycling I keep thinking about the different pallet wood inspirations. But this isn’t a bad thing at all I feel, this is a kind of new exploration where I am making the houses much prettier and that too pretty free of cost. 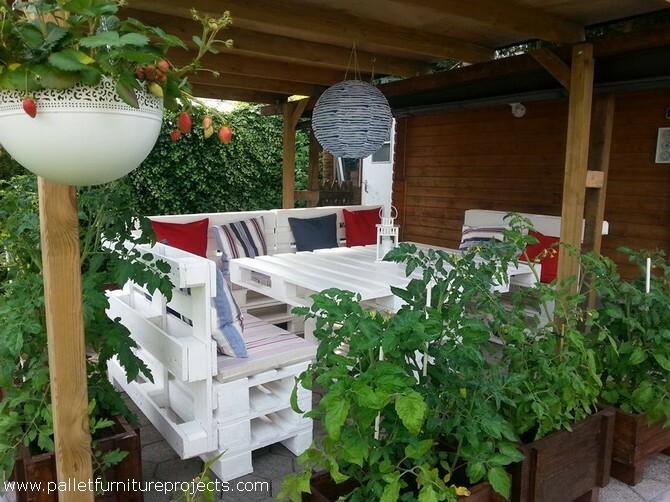 Let’s talk about a grand pallet wood garden pergola along with the pallet wood furniture. 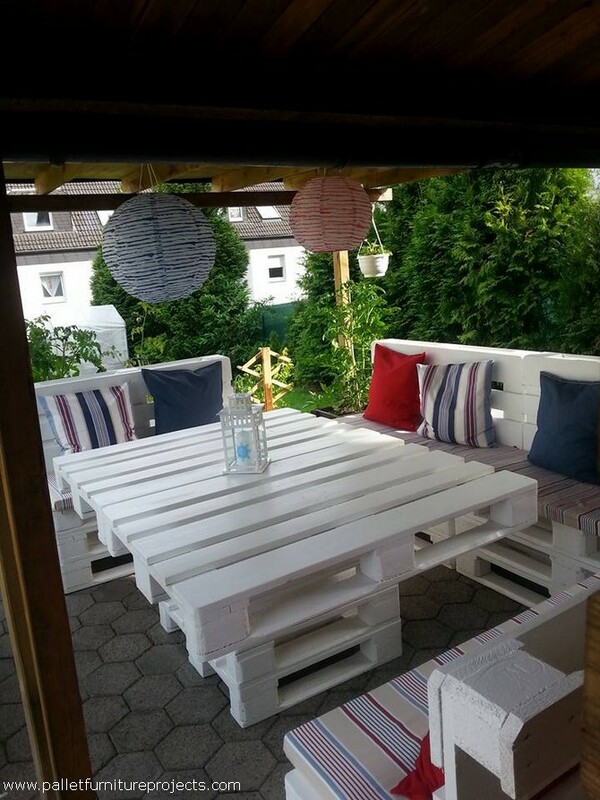 First have a look on the furniture that we have prepared especially for the garden. It includes different wooden furniture articles like a pair of two seated couches, a three seated couch and a wood pallet upcycled table that we have placed in the middle. 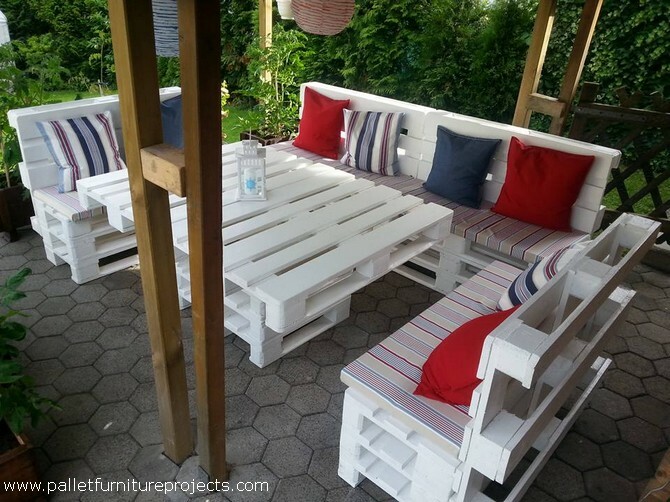 Have a distant look of the set up and just imagine that you are sitting at that very couch in some rainy season and your top is also covered with a wood pallet pergola and you are enjoying the rainy season along with a cup of coffee in your hands. And this is the other side of the venue where we see a number of additional pallet wood repurposed creations that we didn’t discuss earlier like we a see a couple of wood pallet planters filled with fresh plants and green foliage. And in the surrounding we see a grand wooden shade that is actually a pergola which is one of the trendiest and most fascinating pallet wood installations that we see in very well established houses usually. I think this is literally more than perfect for your garden or patio wherever you intend to create this entire set up. 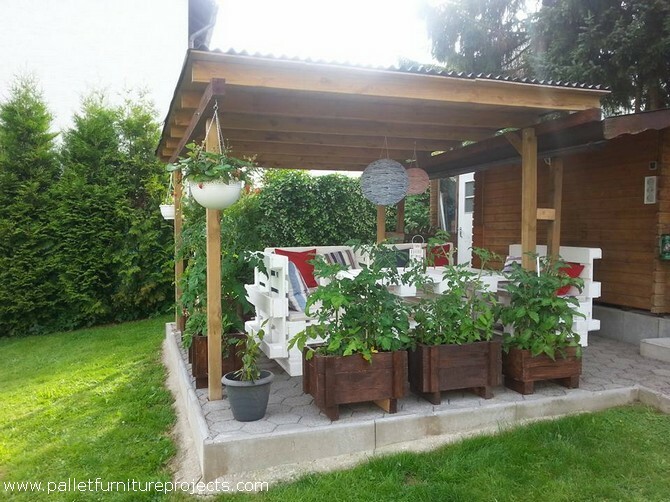 Enjoy the garden pergola and pallet wood furniture.